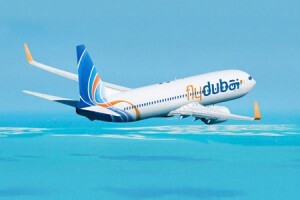 Modern Airliners Civil Aviation Aircraft. Modern Airliners and Civil Aviation Aircraft. Looking back to that day on an isolated dune at Kitty Hawk, one can only marvel at the humble beginnings to such an explosion in technology and an industry that it would feed. 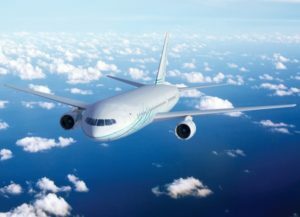 Over the last hundred years such leaps forward have been made in new aviation technology, fueled by the ever increasing demand for mobility around the planet for leisure and for business. Various wars throughout the twentieth century helped to push forward with progress as governments made funds available to find ways to fly faster and higher than the enemy. 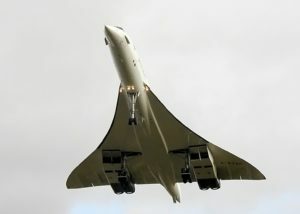 The latter part of the 1900s and the beginning of the 2000s has been effected by the 1970 oil crisis and its legacy and seen a move toward more economic and eco-friendly airplanes. Airlines are now demanding more from plane makers. They need to reduce their kilometer/seat costs, they need to observe more stringent noise reduction laws enforced by airport authorities as their airfields are being surrounded by creeping urban expansion. Aircraft construction materials need to be lighter and more impervious to corrosion. In short, aircraft manufacturers are being pushed very hard to come up with new technologies that will reduce operating costs for airlines as well as keeping the aircraft in the air longer, thus earning airfare dollars. This site will provide some insight into the more popular airliners in the skies today. We will continue to add more aircraft, so please bookmark and come back to visit us. 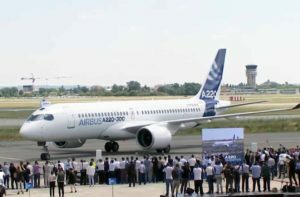 Airbus A220-300 first landing. So where did Airbus suddenly produce a new aircraft from and why the change to the numbering system? 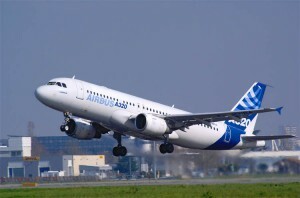 An Airbus A320 in-house livery takes off. 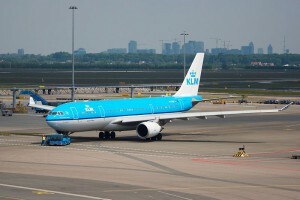 A KLM Airbus A330 203. 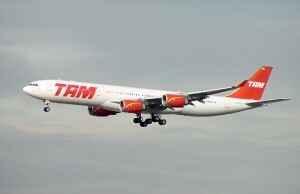 Airbus A340 in TAM livery makes an approach to land. 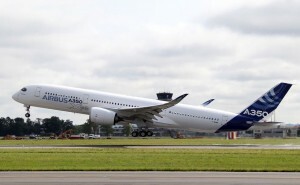 Click to learn more about the Airbus A350. 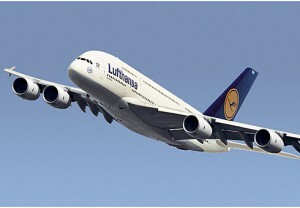 The Lufthansa A380 doing a fly over. 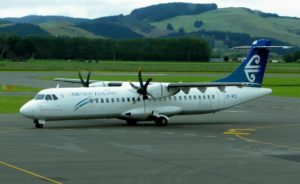 Air New Zealand ATR 72 ZK-MCO at Dunedin Airport. The ATR is another example of European aircraft makers collaborating to produce outstanding aircraft. 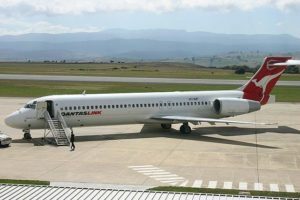 The Boeing 717 started life on the drawing board as the McDonnell Douglas MD-95 until MD was merged with Boeing. 156 of the type were produced. The Boeing 727 was Boeings’ only ever tri-jet and was manufactured for 21 years from 1963 to 1984. 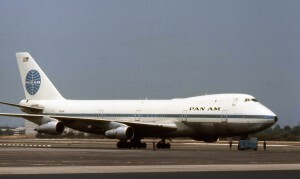 A Pan Am Boeing 747 100, Queen of the Skies. 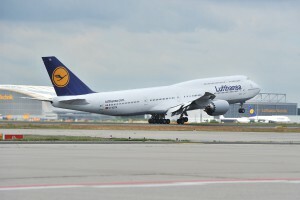 A Lufthansa Boeing 747 8 Intercontinental takes off. 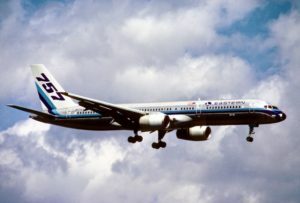 The Boeing 757 is a narrow body single aisle airliner that was produced from 1981 to 2004. 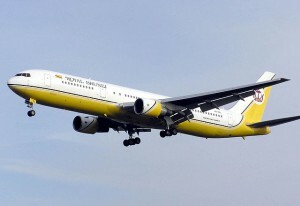 The Boeing 767 was Boeings’ second wide-body jet and was aimed at the middle of the market. Two stretches later and it has proven to be a formidable work horse. 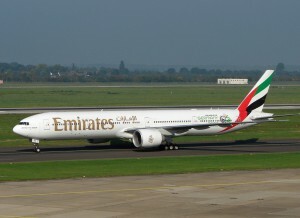 An Emirates Boeing 777 300ER taxiing. The 777 pioneered many new technologies in manufacturing and remains the mainstay of many airlines. 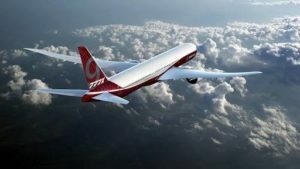 The Boeing 777X as it has been known through the planning stage is Boeing’s flagship of the future. 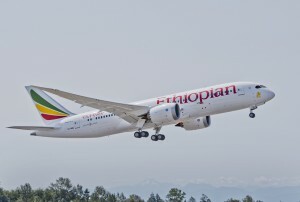 Now having been renamed the 777-8 and the 777-9 for the two variants which should start service in the early 2020s. 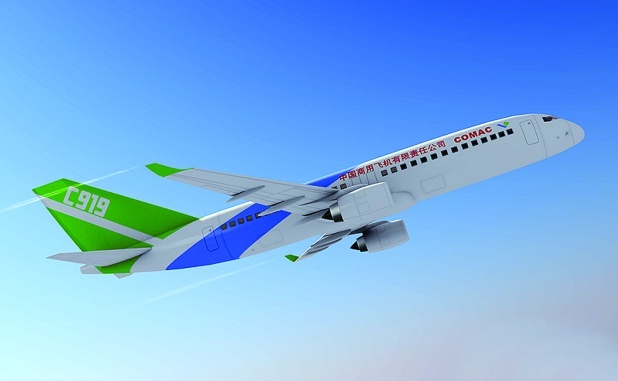 The COMAC C919, Chinas’ own airliner, was scheduled to fly in 2014 and enter service in 2016. Embraer E Jet Family of airliners including ERJ 170, ERJ 175, ERJ 190 and the ERJ 195. Russia is working on a radical new design for the short to medium haul market. The Frigate Ecojet. 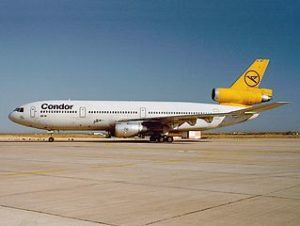 A McDonnell Douglas DC-10-30 of Condor, a German leisure airline based in Frankfurt. This site is constantly growing so be sure to book mark us and check back. Feel free to leave any comments or questions below too we would love to hear from you. Our menu at the top has lots of other interesting options also. Well, you really seem to know your stuff! Surely, I will revisit your site for all my aviation inquiries. Nice niche! Hi Lina, thank you. There will be new stuff coming all the time so yes please check back with us. thanks for stopping by. Yes, if you can’t fly everyday at least you can look at and talk about aircraft. I remember the 727 from the 1960s. My first thought when I saw its photo was, “Oh yeah, the noisy one if you sit in the back!” Still a beautiful airplane, and a heck of a lot faster than the 707. Agree that you know your stuff. Also loved the video of pilot landing 737 in extreme turbulence. Woohoo! Thanks for stopping by Nina. Yes the 727 was noisy in the back with three pure jets screaming around your head. Further forward it was a dream as all the engine noise was left behind. The only one I ever got to fly on belonged to Yemenia from London to Athens and back. The 727 was not faster than the 707. 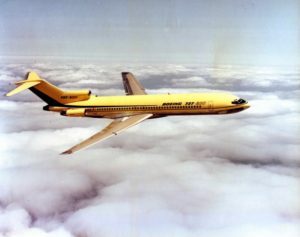 The 707 was one of the fastest sub-sonic airliners ever. The early pure turbojet versions typically could go as fast as .90 mach. The later version 707-320B got the low-bypass P&W engines and that slowed it down to .87 to .88 mach. In contrast, the 727 usually cruised at .78 to .82 mach. The Advanced 727 with the JT8D-17R engines had 16,400 pounds of thrust, not 17,400 as shown on your 727 page. This is frequently misquoted. I think because there is a typo in the Boeing manual “Airplane Characteristics, Airport Planning”, which is a highly disseminated .pdf file that can be downloaded by anyone from the Boeing website. And many people get information from that document. On page five it lists the 17R as having 17,400 lbs. takeoff thrust but in the paragraph underneath that listing it correctly indicates 16,400 lbs thrust for the very same engine. 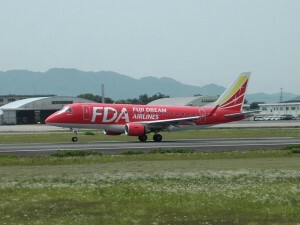 It was simply a typographical error and Boeing documents usually have a few. Many other sources, such as Pratt & Whitney, the engine’s builder, also quote 16,4000 pounds. And they should know!! Actually, my previous statement regarding maximum thrust for the JT8D-17R is only partly right. The 17R equipped 727-200 Advanced had the APR system which would kick in two remaining engines at 17,400 pounds of thrust if one of the other two engines quit during takeoff or climb out. But normally the thrust rating for takeoff is 16,400 pounds if everything was fine. So the 17,400 is only for emergency engine out situations. And this APR was only offered for the 17R engine, not the plain 17 or 15. Thank you for this insight, I will check that out. Comforting to know Boeing make so many typos. thank you for stopping by. Be sure to mention us in your social media. As usual a wealth of info on everything airliner related. Always curious what your take on the topics of the day are. Keep it up! !